Barriers help an animal to defend itself from the many dangerous pathogens it may encounter. The immune system recognizes foreign bodies = “not self” and responds with the production of immune cells and proteins. 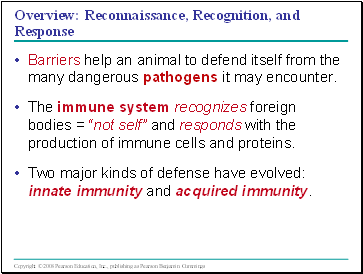 Two major kinds of defense have evolved: innate immunity and acquired immunity. 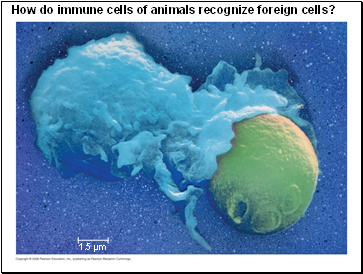 How do immune cells of animals recognize foreign cells? 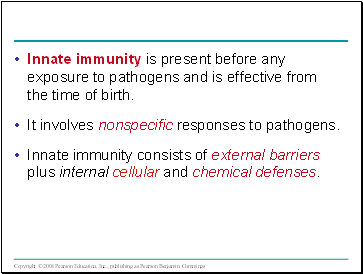 Innate immunity is present before any exposure to pathogens and is effective from the time of birth. It involves nonspecific responses to pathogens. 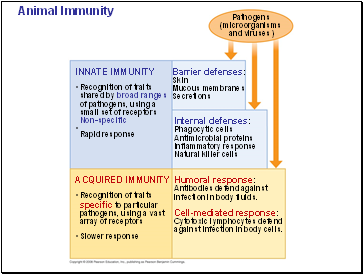 Innate immunity consists of external barriers plus internal cellular and chemical defenses. 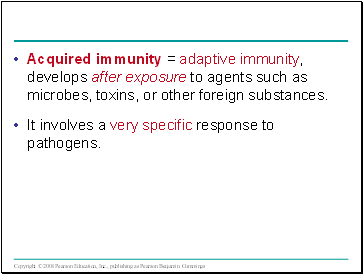 Acquired immunity = adaptive immunity, develops after exposure to agents such as microbes, toxins, or other foreign substances. It involves a very specific response to pathogens. against infection in body cells. 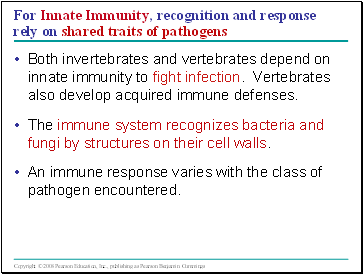 Both invertebrates and vertebrates depend on innate immunity to fight infection. 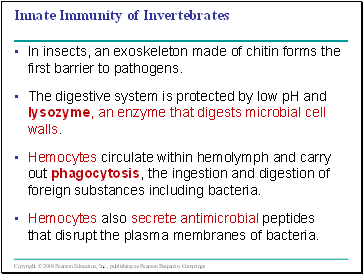 Vertebrates also develop acquired immune defenses. The immune system recognizes bacteria and fungi by structures on their cell walls. An immune response varies with the class of pathogen encountered. In insects, an exoskeleton made of chitin forms the first barrier to pathogens. The digestive system is protected by low pH and lysozyme, an enzyme that digests microbial cell walls. Hemocytes circulate within hemolymph and carry out phagocytosis, the ingestion and digestion of foreign substances including bacteria.